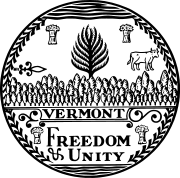 The Vermont gubernatorial election of 1968 took place on November 5, 1968. Incumbent Democrat Philip H. Hoff did not run for re-election to another term as Governor of Vermont. Republican candidate Deane C. Davis defeated Democratic candidate John J. Daley to succeed him. ^ a b "Primary Election Results" (PDF). Office of the Vermont Secretary of State. Retrieved 31 December 2014. ^ "General Election Results - Governor - 1789-2012" (PDF). Office of the Vermont Secretary of State. Retrieved 31 December 2014.